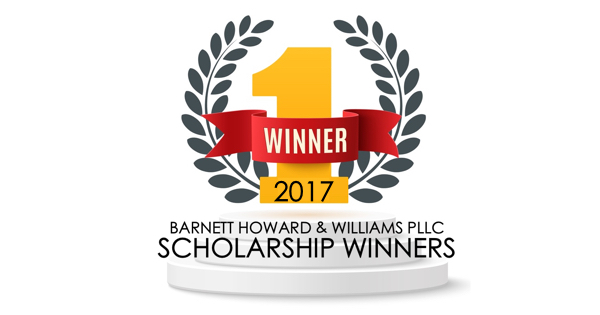 Fort Worth, Texas, August 15, 2017	(Newswire.com) - ​This was the second year for Fort Worth law firm, Barnett Howard & Williams PLLC to offer scholarships to two deserving students. In honor of the sacrifices of our nation's military veterans, BHW decided to connect the scholarships to military service. The first scholarship is a $500 award for a Military Veteran Law Student and the second scholarship is a $500 award for a Military Dependent undergraduate student. Throughout the year, BHW received several applications from very deserving students. "We appreciate all the students that took the time to apply for the scholarships and wish them all the best in their studies," said Brandon Barnett, a partner at the firm. For those students that were not selected, BHW invites them to reapply next year as they plan to continue the scholarship offers as an annual award. The winner of the 2017 Military Veteran Law Student Scholarship is Lieutenant Commander OMAR HASAN. Omar Hasan is a Navy veteran with over 20 years of active service to our country. LCDR Hasan is set to attend Regent Law School in Virginia Beach, VA. Congratulations, Omar Hasan. Fair winds and following seas and best wishes as you continue toward your law degree. The winner of the 2017 Military Dependent Undergraduate Scholarship is JESSICA OLMEDO. Jessica Olmedo is a US Army dependent whose father is served, among other places, in Operation Just Cause in 1989. Ms. Olmedo currently attends Texas Christian University in Fort Worth, Texas and is pursuing a degree in Business Information Systems and Supply Chain Management. Congratulations, Jessica Olmedo. Best wishes as you continue your studies. Mr. Lotspeich will manage the Personal Injury Branch of Barnett Howard & Williams PLLC. Steve Scott, Army veteran and owner of the Texas-based Scott's Police K9 LLC, recently launched a new venture that will provide service dogs to PTSD-disabled combat veterans of the U.S. military free of charge. Barnett Howard & Williams PLLC, a criminal defense law firm in Fort Worth, recently finished a complete renovation of the historic Atelier Building (built in 1905) in downtown Fort Worth.